Every American resident and visitor has their favorite beach. For some, the inland beaches of the Great Lakes are the greatest, while others prefer the historic spots of New England or the sunny sunbathing hotspots of Los Angeles and the Mississippi Gulf Coast. For many people, Florida is the best beach state of all. Possessing the longest coastline of any contiguous state and gorgeous sunny weather all-year long, the Sunshine State is best-known for its world-famous theme parks and rollercoasters, but it also stands out for being home to some of the best-ranked and most beloved beaches on Earth. From Tampa to Miami, Florida has a long list of awe-inspiring beaches for people of all ages to enjoy. Whether you're looking to swim, sunbathe, snorkel, fish, sail, or something else, you'll find what you need, and some of the state's finest beaches are located in the Cape Coral area. Not far from the city of Fort Myers and perfectly situated near a long line of barrier islands and natural preserves, Cape Coral is a super spot to enjoy a beach vacation in Florida, with some truly world class locations being found all around the city. Some of Florida’s best beaches are found near Cape Coral, so it’s definitely a fine place to visit if you’re looking for a Florida beach adventure. Whether you’re interested in shelling, swimming, sunbathing, surfing, kayaking, or another kind of beach activity, you’ll find what you need in the Cape Coral area. Read on through our guide to learn all about the best beaches in Cape Coral, FL. Highly popular with Cape Coral locals and tourists alike, Lovers Key State Park is one of the top spots to visit in this area. The beach used to only be accessible by boat, but a tramway has since been installed along with a boardwalk, making the island much easier to get to. All kinds of beach activities can be enjoyed at Lovers Key, including swimming, sunbathing, and beachcombing. This is also a very popular beach with wildlife enthusiasts as all kinds of animals can be spotted here from playful dolphins to soaring eagles, and one great thing to do at Lovers Key is sign up for a guided eco kayak tour to get up close and personal with some of the native wildlife. As the name suggests, Lovers Key is also a romantic destination for couples and has a very calm, peaceful kind of atmosphere. Sanibel Island is generally regarded as one of the most beautiful beach locations not just in Florida, but in the entire world, and it's only a short drive away from Cape Coral. 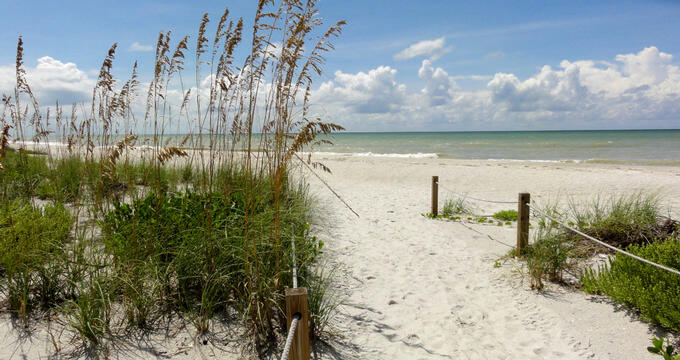 Sanibel Island beaches are therefore a must-visit location on your Cape Coral vacation. There are several public beaches to be found on the island, with Tarpon Bay and Turner Beach being two of the best and offering some of the finest shelling anywhere in the world. A real treasure trove of shiny shells washes up on these beaches all year long, so it's a nice spot to visit if you're looking to find a special souvenir to take home, but there aren’t many amenities here, so it’s a good to pack a picnic and some beach gear. One of the closest beaches to Cape Coral, Lynn Hall Memorial Park is only a 15-20 minute drive away from the city and is part of the Fort Myers Beach area, which features a lot of sand and space for every kind of activity imaginable. This beach is home to the Fort Myers Beach pier, which stretches far out into the ocean and is a great spot for sunset strolls. The park itself has a lot of good features and amenities to appeal to all visitors, especially families, and the nearby streets are lined with good eateries, bars, and shops, so there’s always something fun to do at Lynn Hall Memorial Park. Captiva Island is connected to Sanibel Island, so it's very easy to access from Cape Coral and is generally seen as one of the prettiest beaches in the area. Captiva Beach offers breathtaking views and exceptionally soft sands, making it a lovely place to walk along the water's edge or simply sit and watch the sun going down. There's a very relaxed, romantic atmosphere at this Cape Coral beach too, so it's a nice spot to visit with that special someone in your life. If you really want to surprise the person you love the most, bring them to Captiva Island for a full day of rest and relaxation and make magical memories that neither of you will ever forget. Barefoot Beach is located at Bonita Springs in a protected area with a lot of lush vegetation and fascinating wildlife. It's one of the only Floridian barrier islands to be completely untouched and undeveloped, covering around 342 acres of land in total and fully accessible via Bonita Beach Road. It's been ranked by experts as one of the prettiest beaches in the nation, and as the name suggests, Barefoot Beach has some sugary soft sands that are best experienced with bare feet. Restrooms and showers are located at this beach and you'll need to pay a small fee to gain access, but the white sands and turquoise waters definitely justify the cost.